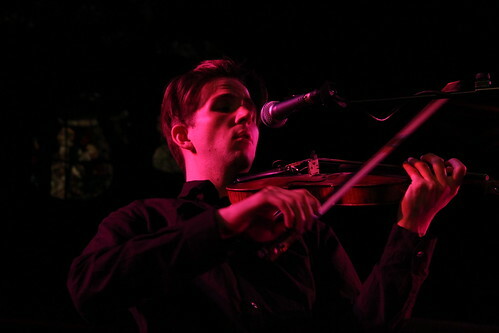 Owen Pallett is one of those artists who I keep hearing about, but have never really listened to. Everything Iâve heard, however, has enforced my view that heâs someone I really would like. On a similar note, Iâve never actually been to the Union Chapel, despite the length of time Iâve been in London and the amazing acts that appear there. So, needless to say, I was excited about tonight. Stepping inside the Chapel really filled me with a sense of wonder. I was expecting something modernised, converted, with windows blacked out and seats removed â instead I found myself inside a beautiful church, albeit an oddly shaped one, with pews and stained glass still intact, and even sporting those old-school heaters that only warm you up if youâre within 30cm of them. This, combined with the ambient music wafting from the speakers, really lent a sense of occasion to the evening. I couldnât help wishing that everyone would stop talking so I could just sit there and soak up the atmosphere. The first support was DevontÃ© Hynes, also known as Lightspeed Champion, who was apparently asked to play a week ago via direct message on Twitter â the joys of social networking were clearly felt in the Chapel this evening. He has a wonderfully soulful voice, with real passion and heartfelt lyrics â you got the feeling that he could really raise the roof if he let himself go. He started with an Elvis cover, moving onto the piano for his second number, âDead Head Bluesâ, a new song that will be on his next album. He was quite self-deprecating in his interaction with the crowd, but in a way that just made you want to give him a great big hug. 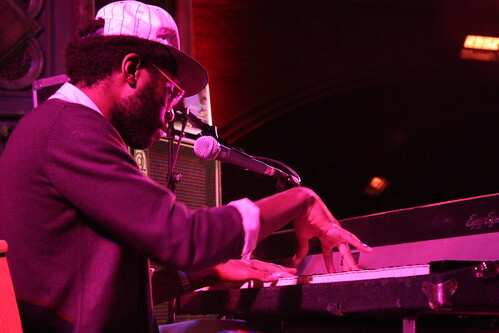 There was a slight unplanned, open-mic feel to his set, which added to the sense of intimacy the setting provided. After another new track and a song inspired by Patty Highsmith, he played was a Gary Wilson cover from Garyâs second album, âafter he went crazy and became obsessed with his ex-girlfriendâ, in Devâs words. 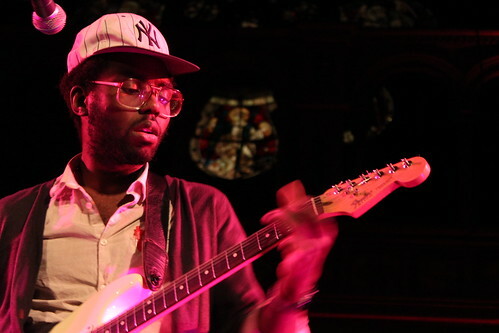 He chose âMiddle of the Darkâ for his penultimate song, which is the final track on his new album. This was a wonderful track which reminded me ever so slightly of South, although his vocals were less breathy. The tempo change mid-song was unexpected, but very effective, and led on to a fantastic piano solo which closed the track. His final track, âDevil in Disguiseâ, was a much more upbeat number, with fun lyrics and a catchy tune, providing a great end to a great set. He had certainly set the set the bar high for the evening. 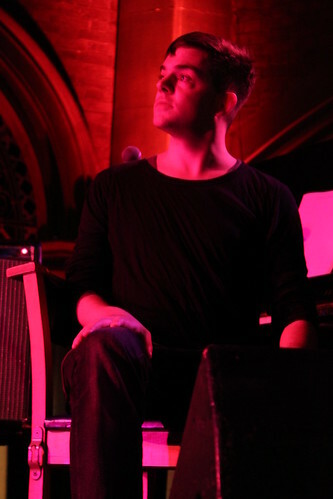 Setlist: Surrender Dead Head Blues Midnight Surprise The Big Guns of Highsmith Dance With Linda Middle Of The Dark Devil In Disguise Sam Amidon and Nico Muhly provided the second support act, under the name âSam and Nicoâs Variety Hourâ. Nico is an exceptionally talented pianist, while Sam is an equally talented violinist, banjo player and general merriment-maker. They started out with two American-Irish folk songs, followed by a solo piano piece that Nico played entirely to Sam, who spent the track sitting on the floor next to the piano. 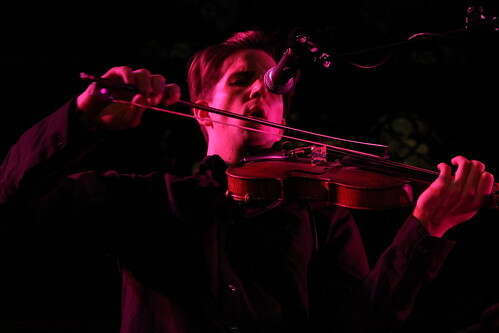 For their fourth track, Sam started off creating feedback with his violin, leaving the audience unsure whether to laugh or stroke their beards. There was a small amount of nervous laughter, which intensified when Sam slowly but surely mutated the feedback into an Irish reel. His violin was entirely acoustic but picked up wonderfully by the mic â which had the additional effect of amplifying his voice to a ridiculously large level, something he utilised to great effect over the feedback. Nico accompanied the reel with some percussive sounds on the piano, before taking over from Sam and moving the tune into a flowing piano solo. Sam and Nicoâs songs were exquisitely crafted, and they both worked seamlessly together, although I would love to know how much was composed in advance and how much was invented on the spot. The two of them had a great rapport with each other and with the audience, and seemed to daydream through much of their set â wandering around and playing wherever seemed most comfortable â as though they had ambled on to a stage seemingly by mistake. Their fifth track was a German folk song. They joked at the start about the purpose of folk songs (to raise spirits), and then seemed perturbed that, upon reaching a natural break in the song, their rendition hadnât had the expected effect of summoning a female voice. Nevertheless, they kept the music going, jamming and chatting to each other and the crowd, until Owen went to fetch the âvoiceâ from backstage, who turned out to be Beth Orton. She had a wonderfully breathy voice but seemed slightly unsure of the words and, indeed, her place in the whole charade. I would have liked to hear more harmonising rather than her and Sam singing together, as his voice rather drowned hers out at times. When they did harmonise, however, their voices complemented each other very well. Owen joined them on stage for their next track, which was a song Beth had written in the past few days and seemed much more comfortable with. Unfortunately Owen was slightly too far away from the mic for the acoustic violin to be picked up all of the time, but when you could hear him, it sounded wonderful. The violin had that scratchy, slightly nasal yet mellow quality typical of the folk sound, which is something I have a particular soft spot for. Beth and Owen left the stage for the final song, introduced as âVision Of The Apocalypseâ â a soft American folk ballad particularly suited to our surroundings, which was received in awed silence until a modern dance/mime by Sam in the final throes caused people to break out into laughter once more. Setlist (helpfully written down by Sam in between trying to sell CDs): How Come That Blood O Death Hudson Cycle âRandom Fiddle Stuffâ Nicoâs Piano Piece Schumann Diechter Liebe Sugar Baby âBethâs New Songâ Tribulation The first thing I have to say about Owen Pallett is wow, that man can sing. He has an incredible vocal range and a stunningly pure voice â so much so that at the top of his register he sounded every bit as melodic as his violin. He was joined on stage for some of his set by Tom, who provided whistling, percussion, guitar and backing vocals at various stages throughout the evening. Together, they made quite a team. For those of you unfamiliar with Owenâs work, he plays an electro-acoustic violin through a pedal, which he then uses to loop back the melody heâs just played (and, at times, octavise it) allowing him to play over the top, creating wonderful layers of textured sound (and conveniently eliminating the need for that tedious business of double stopping, something which he also proved to be exceedingly good at, to my chagrin). 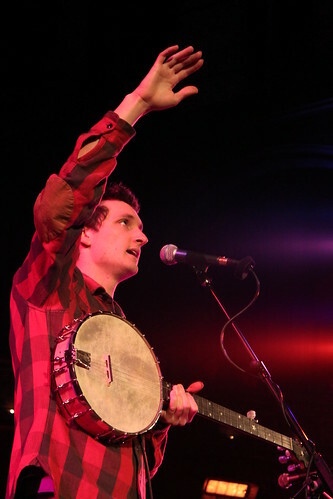 During âFlare Gunâ, Owen broke into a fit of coughing halfway through, and sheepishly apologised to the audience, before him and Tom seamlessly picked up from where they left off. From there they moved into âThe Butcherâ, which began with some typically Baroque marcato work on the violin (Forgive me. As a violinist myself I very rarely get the opportunity to go all technical on people about my instrument). 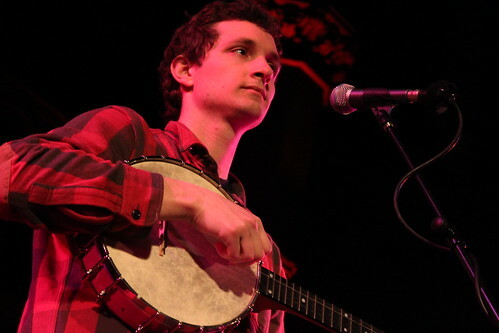 After this, Tom left the stage and Owen played the next few by himself. The first of these solo pieces, '49 MP', started with ethereal, atmospheric drones on the pedal, which Owen complemented beautifully with some wonderfully soft broken chords (Iâll stop with the technical now, I promise), breaking out into an emotional ballad with a lovely celtic feel. For the following song, he unplugged his violin and played the whole piece acoustically, allowing the beautiful natural sound of his violin to shine through. The crowd responded fantastically to the entire set â however good the support acts had been (and boy, were they good) it was clear who people were here to see. For myself, I spent so much time entranced by the violin that I didnât really follow his lyrics, but every now and then a word would break through and lodge in my brain â strangely enough, âcocaineâ and âmassive genitalsâ are the ones that spring to mind. 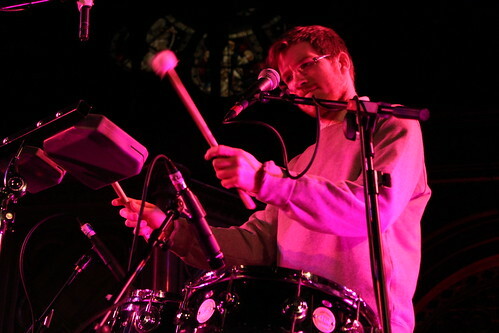 Tom rejoined the stage for the last few songs â one of which saw Owen take to his keyboard, layering this up over violin loops, allowing him to use his violin as a percussion instrument for a time, before that too got added to the loop and the piece continued to build up until the original keyboard riff was barely discernable. At this point, Owen gradually removed the layers until he was back at the keyboard playing the original melody. After their final song, âLewis Takes Off His Shirtâ, Owen was called back to the stage by feet stamping reminiscent of a school assembly. He seemed slightly overwhelmed by the response, politely declined the request thrown at him by the audience, and played âThis Is The Dream Of Win And Regineâ to tremendous applause. 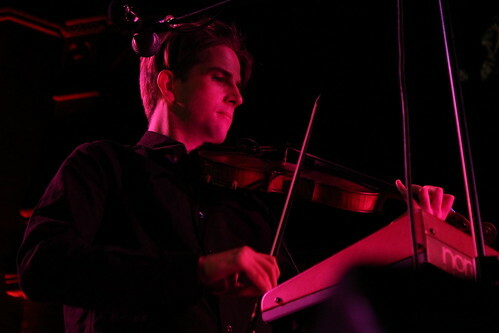 Owen really does have an exceptionally powerful voice, and plays the violin with a skill and flair Iâve rarely seen. Itâs wonderful to see the instrument used in such an imaginative way, and one that really shows off its versatility when in the hands of an expert. The whole evening had me speechless, and I wouldnât have missed it for the world. Setlist: E for Estranged This Lamb Sells Condos Midnight Directives Flare Gun The Butcher 49 MP Dream Tree He Poos Clouds Thatâs When The Audience Died Lewis Takes Action Keep The Dog Quiet This Great Elsewhere Honour The Dead Or Else Lewis Takes Off His Shirt This Is The Dream Of Win And Regine (Encore) What say you on this? Sound off in our Fourum!